Every time you walk in the rain, this is what happens. This Earth that we live on is covered in water. Imagine a cube that’s one mile tall, wide and deep, then imagine that cube filled with water. Now imagine 300,000,000 of those cubes–That’s how much water covers the Earth. Every day 280 of those one-mile-cubes evaporate into the atmosphere. Heat from the Sun helps this evaporation take place. The Sun is an enormous fireball roughly 93,000 miles from Earth. To put “enormous” in perspective, you could fit nearly 1,000,000 Earths inside the Sun. The Earth is the only planet that exists at the perfect distance from the sun to be warmed, but not consumed, by its heat. After those 280 one-mile-cubes of water are warmed by that fireball 93,000 miles away, they become water vapor and create clouds. There are around 3,100 of those one-mile-cubes of water existing in our atmosphere at any time as water vapor. As vapor, the water isn’t heavy enough to fall back to Earth. But as the cloud droplets attach to dust particles and collide with each other they become larger and larger. When millions of droplets finally form together, they create a single rain drop. And then you walk in the rain. And as you walk in the rain those tiny raindrops land on your arms and face. Each and every raindrop was formed when millions of cloud droplets collided with each other miles above the Earth, after being sucked up into the atmosphere because water was heated to just the right temperature by a fireball 1,000,000 times larger than Earth and 93,000 miles away from us. And every day that happens to 280 one-mile-cubes of water. 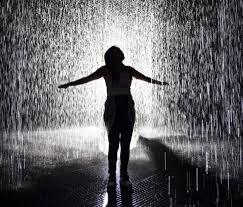 When the rain strikes your skin you can feel it because our bodies contain over 235,000 feet of nerves. Those nerves perceive the water drop, the water drop that is formed from the collision of millions of cloud droplets miles above Earth, because a fireball 1,000,000 times larger than Earth heated 280 cubic miles of water and caused it to evaporate and form clouds–Those nerves perceive the water drop hitting your face and send a message to your brain at over 160 miles per hour, telling you that you’re getting wet. And all of that happens for every single water drop, every time anyone on Earth walks in the rain, every single day. And when you think of it in those terms, it’s actually quite comforting to know that there’s a Creator out there who designed all of that and put it together, then decided to create you and put you here to enjoy it. And if He did all of that just for a single rain drop, think of what He’ll do for you.